Agile Management - CSD Certification in Gurgaon Gurgaon is the largest outsourcing hub in India.The city has many opportunities for skilled and knowledgeable aspirants. Gaining strength from its huge manufacturing industry, the city is making waves in many fields from automobiles to textiles. What Is The Course All About? TheCSD training in Gurgaon will provide a broad survey of scrum tools, techniques, skills and knowledge areas. Topics covered includethe introduction to scrum, scrum roles, and responsibilities, Agile requirements analysis, estimating and prioritising product backlogs, sprint planning, execution, review, and retrospectivesalong with the application of scrum in multiple-team organisations. Through the CSD Course in Gurgaon,aspirants will gain a thorough understanding of the basic concepts that are needed to become a recognised member of the Scrum team. Benefits of the course: Students can learn all levels of Scrum and Developer?s role from the experts in Scrum. They can demonstrate their core Scrum knowledge in the work sphere while expanding their career opportunities across all industry sectors adopting Agile practices. Engaging with a community of recognised Scrum experts, alongside bringing in the perfect blend of formal training with technical skills assessment is the hallmark of the course. All in all, this course provides a working understanding of Scrum principles and specialised Agile engineering skills. 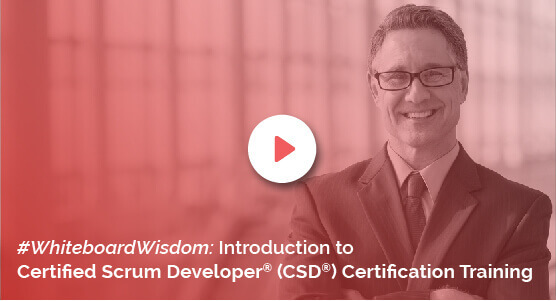 The KnowledgeHut Way: The Certified Scrum Developer Certification course is aimed at software developers building software in a Scrum environment. KnowledgeHut provides this course online at a reasonable cost.Demo and practice sessions are provided for the better understanding of the topics by students. The goal is to expose students to the most important tools and techniques that need to be applied to build good software in an iterative and incremental fashion that Scrum requires. A Certified Scrum Developer training in Gurgaon is appropriate because Gurgaon is a major outsourcing centre in India and professionals who undergo training and hold the CSDCertification in Gurgaon can have a very successful career.